This script is a clone of Magic Bricks which offers a wide range of feature with multiple modules as stated wherein each module has different features to perform the intended jobs as designed. The script will be the one stop solution if you are looking to develop a real estate website to enable your presence online. Our Magic Brick Clone Script has all the relevant features and benefits that could result in bringing a hike to your business career. This is Just a demo, we strive to add extra features on regular basis. Please feel free to contact us for more information. 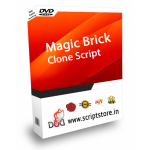 Magic Bricks Clone Script is the easiest, Fastest and secure Php Based script for Real Estate Websites. Download this Magic Bricks Clone Php Script and start your own Real Estate website. Super admin is the ultimate user of the application who can create multiple admins as required.